The Sherpas: a Nepalese people surrounded by myth and mystery, at home in north-east Nepal's Khumbu valley and Everest foothills. They have captured the attention of anthropologists the world over in the same way as North America's Hopi Indians, whose typical family - so runs the academic joke - consists of Hopi mother, Hopi father, Hopi children and an anthropologist. Like the Hopi Indians, the Sherpas are a small but colourful ethnic group with spectacular festivals, a mythology rooted in Buddhism, and numerous legends which shroud scientific research in a fine mist of fantasy. In view of the large number of studies that have been produced, it is perhaps surprising that hardly any research was scrutinizing the Khumbu youth and their lifestyle, their hopes and fears, their ambitions and pastimes. This publication aims to contribute towards motivating a process of discussion and dialogue between the Sherpa generations. It will help the tourist to the Khumbu region to reach a deeper understanding of its people and their culture, and will encourage him/her to enter into discussion with Pasang, Lhakpa, Mingma or Dawa, whatever the nameless porter's name may be. 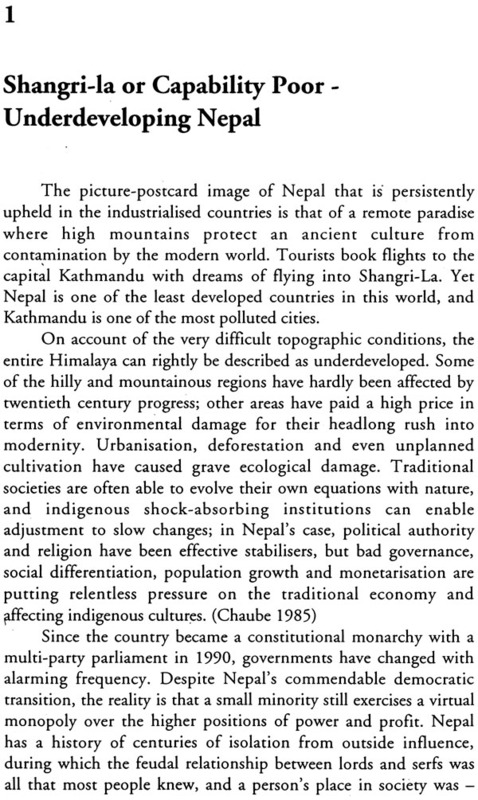 Stories, tragedies, and biographies full of life-force are hidden behind these happy faces, and they provide new insight into Nepal, allow a glimpse of its culture, and lead one to call into question ones own value system and the excesses of European or American civilisarion. The young people's life stories help to bring the Himalaya a human step closer. Kurt Luger is Chairman of the INGO Eco Himal based in Salzburg, Austria, and Kathmandu, Nepal. He is also a professor at the University of Salzburg for intercultural communication and tounsm. The Sherpas: a Nepalese people surrounded by myth and mystery, at home in north-east Nepal's Khumbu valley and Everest foothills. They have captured the attention of anthropologists the world over in the same way as North America's Hopi Indians, whose typical family - so runs the academic joke - consists of Hopi mother, Hopi father, Hopi children and an anthropologist. Like the Hopi Indians, the Sherpas are a small but colourful ethnic group with spectacular festivals, a mythology rooted in Buddhism; and numerous legends which shroud scientific research in a fine mist of fantasy. Not only does the area boast breathtaking scenery, it also affords the researcher a considerable degree of comfort, with well-developed tourist facilities coupled with ease of access to a people to whom foreigners are no longer strangers. 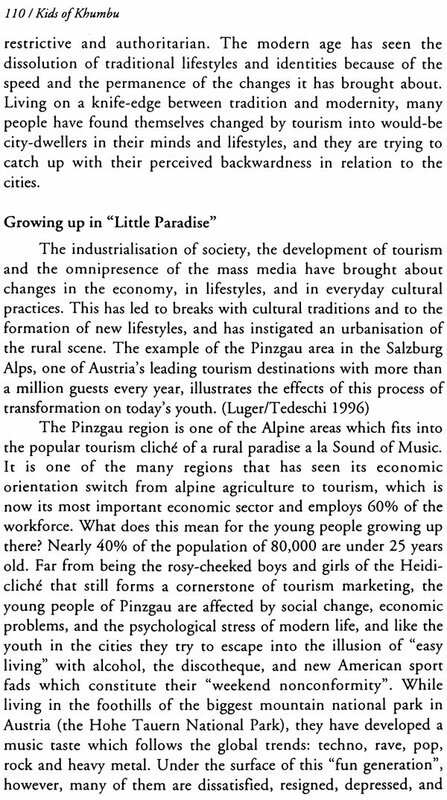 Small wonder, then, that numerous doctoral theses have been written in Khumbu - albeit without the local population ever setting eyes on the wealth of publications that represent them in the academic world. 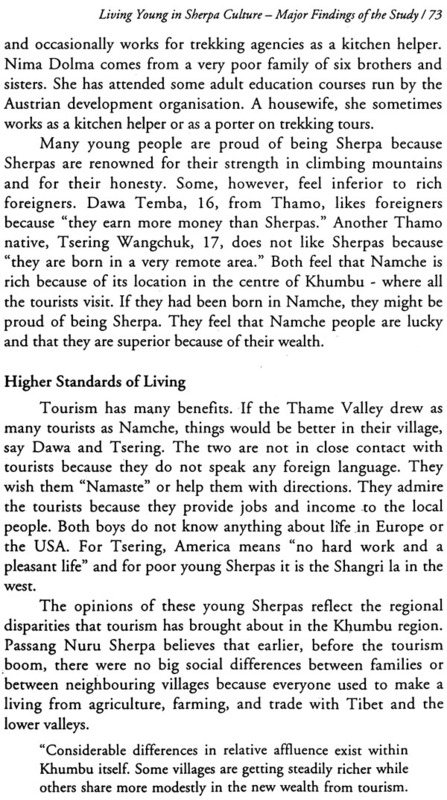 In view of the large number of studies that have been produced, it is perhaps surprising that nobody - apart from James Fisher in his comments on the Hillary schools - has yet turned their attention to the Sherpa youth. From Sherpa marriage ceremonies to colour combinations in the angi, the traditional apron worn 'by Sherpa women, the minutest details have been documented, but one will search in vain in the Himalaya bibliographies for any mention of the Khumbu youth and their lifestyle, their hopes and fears, their ambitions and pastimes - although it is they who in twenty years' time will be the caretakers of the Sherpa culture through the current period of globalisation and dramatic change, and will pass it on to the next generation. Our research project has several objectives. Firstly, it aims to gain some insight into the world of the Sherpa youth and fill one of the blank spaces on the ethnological survey map. Secondly, it presents its findings primarily from the perspective of the young people themselves. The research methods involved - narrative interviews, observations, and group discussions with young and old - enable us to present a picture in which the subjects of our research are themselves the active force and speak with their own voice instead of being relegated to the status of research material. Thirdly, our discussions with the Sherpa youth give us some insight into the effects of tourism, mobility and education - key factors in the process of cultural change and the modernisation of developing societies. Fourthly, it attempts to draw comparisons between the Sherpa regions and the Austrian Alps, establishing a relationship between the lives of the young people of two mountain regions in different parts of the world. This publication aims to contribute towards motivating a process of discussion and dialogue between the generations. We also hope that it will help the tourist to the Khumbu region to reach a deeper understanding of its people and their culture, and will encourage him/her to enter into discussion with Pasang, Lhakpa, Mingma or Dawa, whatever the nameless porter's name may be. Stories, tragedies, and biographies full of life-force are hidden behind these happy faces, and they provide new insight into Nepal, allow a glimpse of its culture, and lead one to call into question ones own value system and the excesses of European or American civilisation. 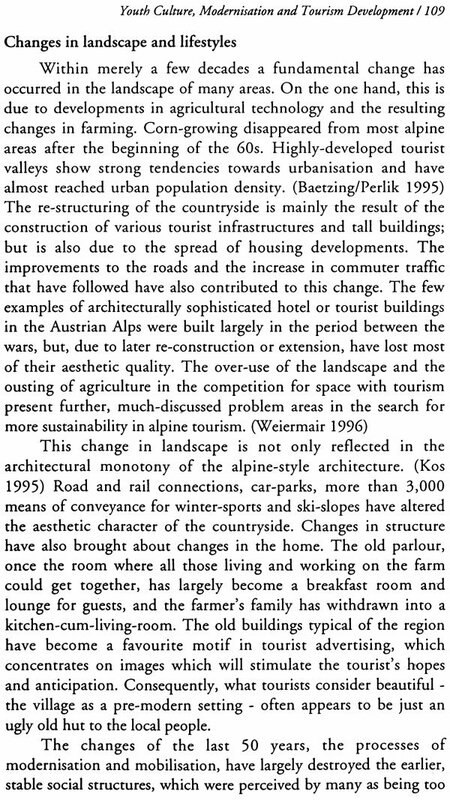 Austrian Airlines now flies non-stop from Vienna to Kathmandu and brings us within spitting distance of the distant roof of the world, but the majority of the people who live in these mountains, though so eager to catch up with today's globalisation, are decades of development away. 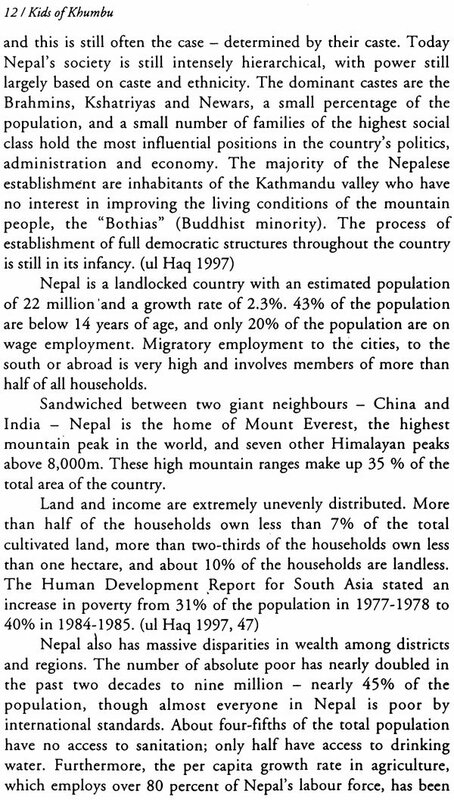 The young people's life stories help to bring the Himalaya a human step closer. This study would not have been possible without the kind support of a large number of Sherpas of all ages. I would like to express my warmest thanks to every one of them, in particular to Eco Himal’s Sherpa staff and of the Khumbu Bijuli Company crew in Thamo. None of Our discussions, oral data and interpretations would have been possible without Mingma Nurbu Sherpa and Namgyel Zangbu Sherpa, who were invaluable both as local experts and research assistants. And many thanks to my colleagues at the Centre for Nepalese and Asian Studies (CNAS) at Tribhuvan University, Kathmandu, where I spent a monsoon research semester as guest professor, for fruitful academic exchanges and for allowing me to devote so much of my time this study. And finally, my sincere thanks to Patricia East, Dieter Rachbauer, Ramyata Limbu and Karin Luger. Together we carried out some of the field research and they also helped to interpret the finding of the study or to put them into clear and comprehensible from.